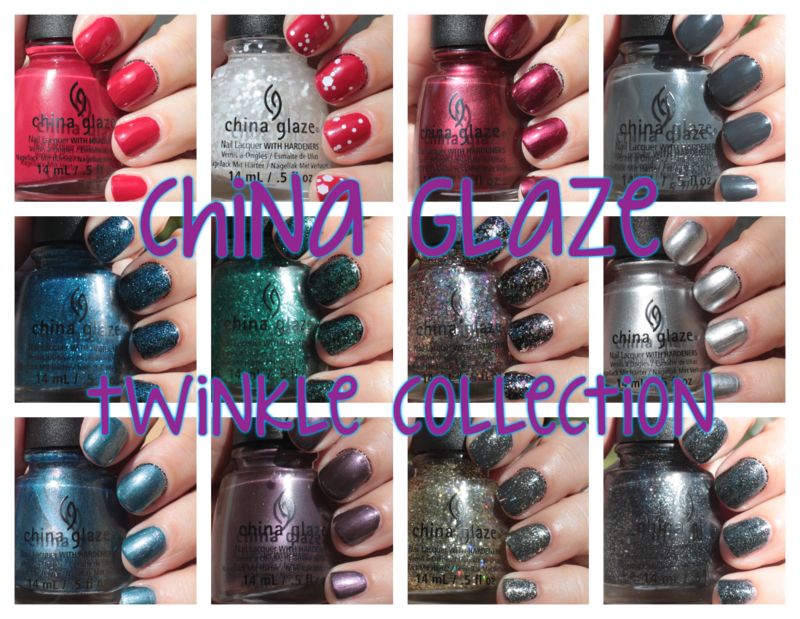 This post - the China Glaze Twinkle Collection - has been a long time coming. It seems like every time I sat down to get this post ready, whether it was to crop and watermark the photos, or to actually sit down and write this post, something got in the way! Well, here's hoping I can get this all done right now so I can get it posted. I got up early to try! And.... it's my wedding anniversary! My husband and I have been married for 12 years today :) There's a LOT of pictures here, probably more than any other post I've ever had. Tip Your Hat: hands down, my favorite of this collection! 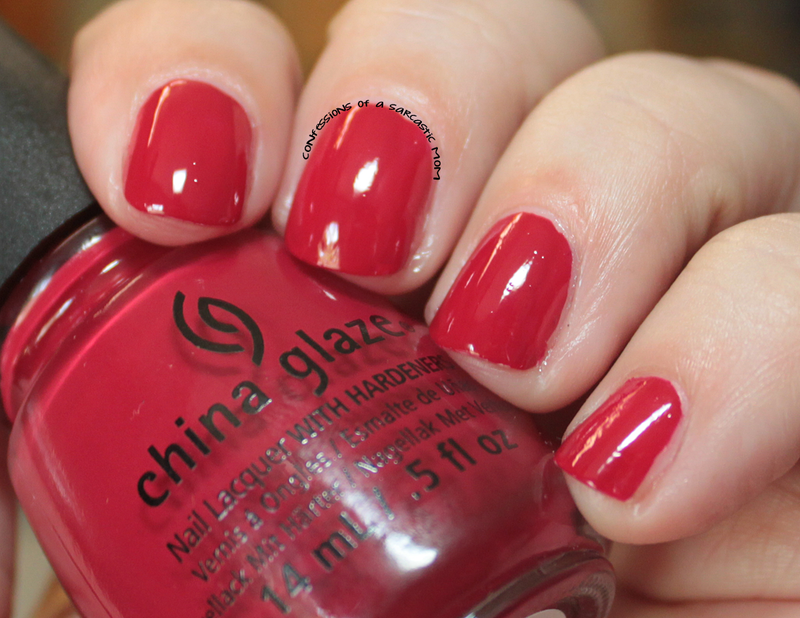 It's the perfect red with the perfect formula. I would wear this again and again. It's got just a touch of pink in it. Define Good...: This one makes me think of Beautiful Creatures haha! I went through a phase where I watched movie that constantly. 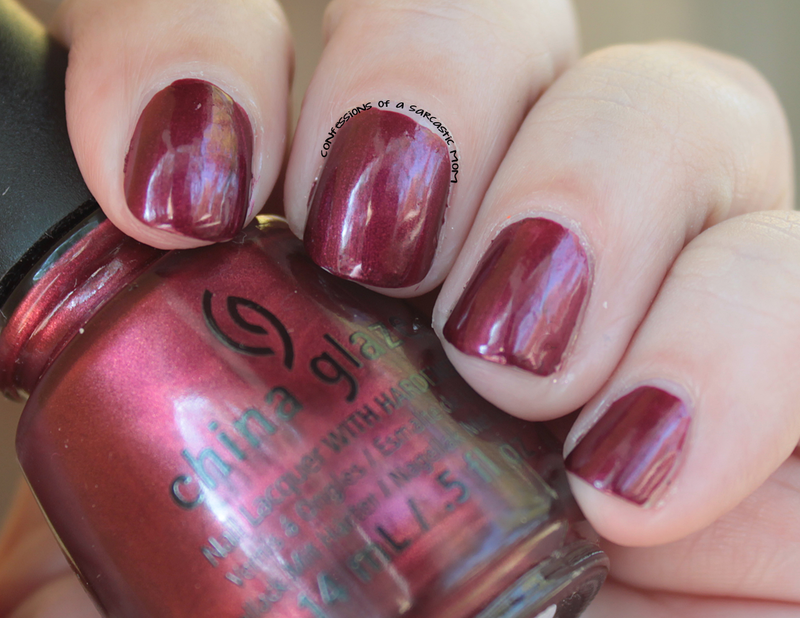 It's a line from the movie :) This cranberry-esque shimmer is a close second for my favorite of this collection. 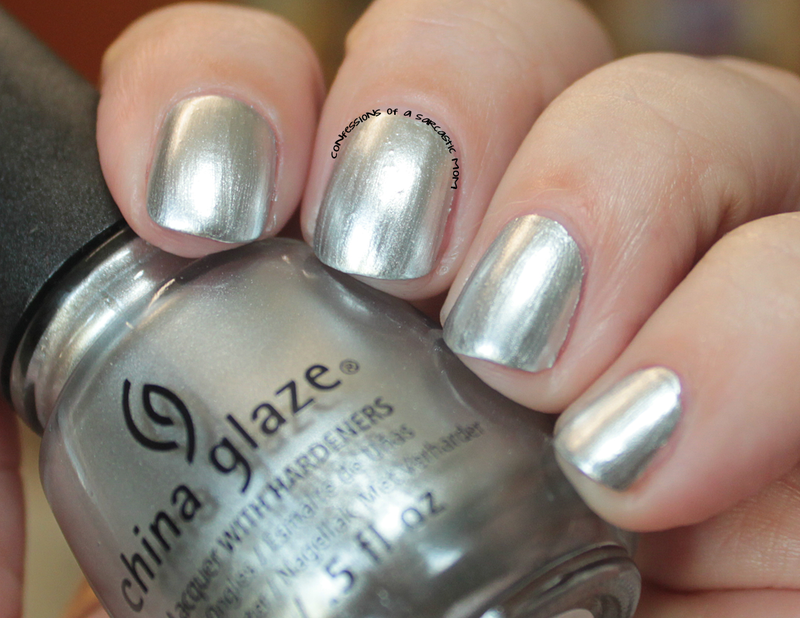 The application is smooth and is good in two coats. 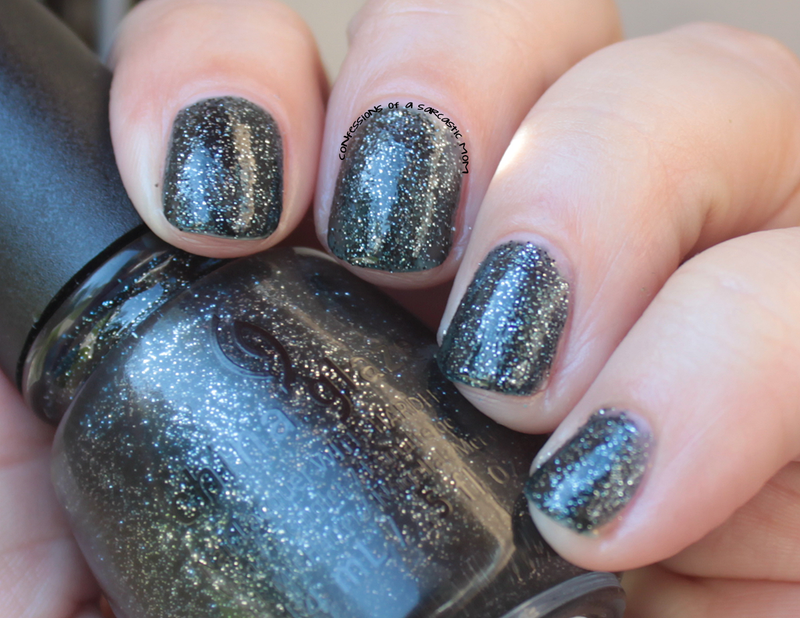 Feeling Twinkly: This one I had to swatch over a base of black. 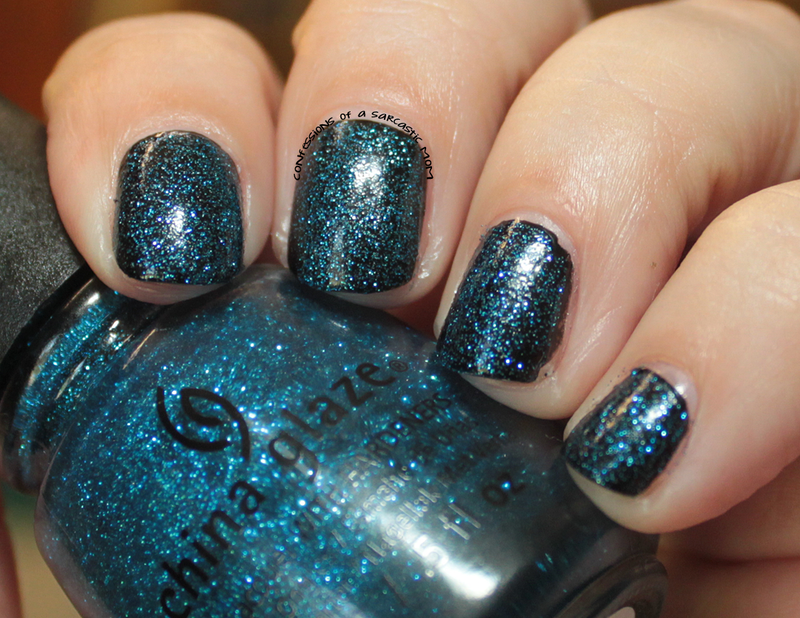 This is a very fine bright blue glitter. 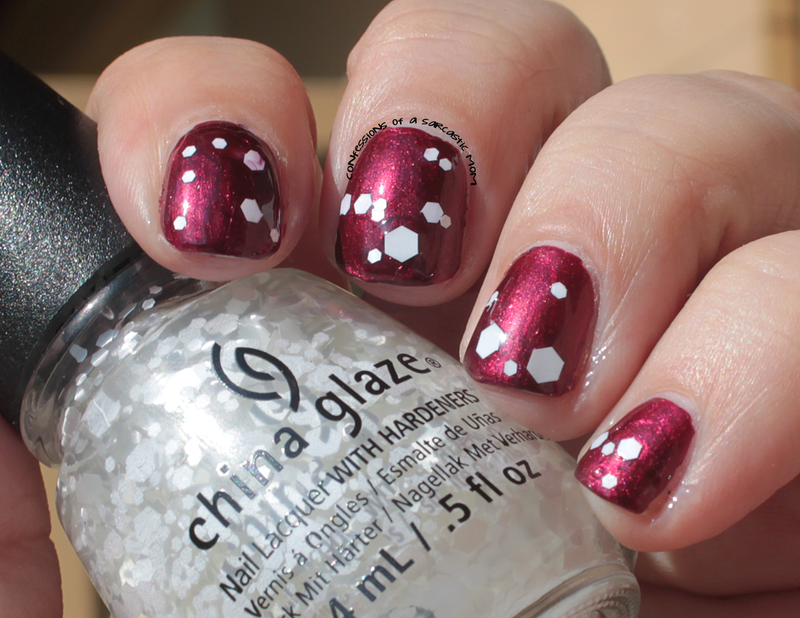 The base is clear, as far as I can tell, and the glitter is densely packed. I just like the depth a black base gives it :) I'm pretty sure this could be opaque on it's own. 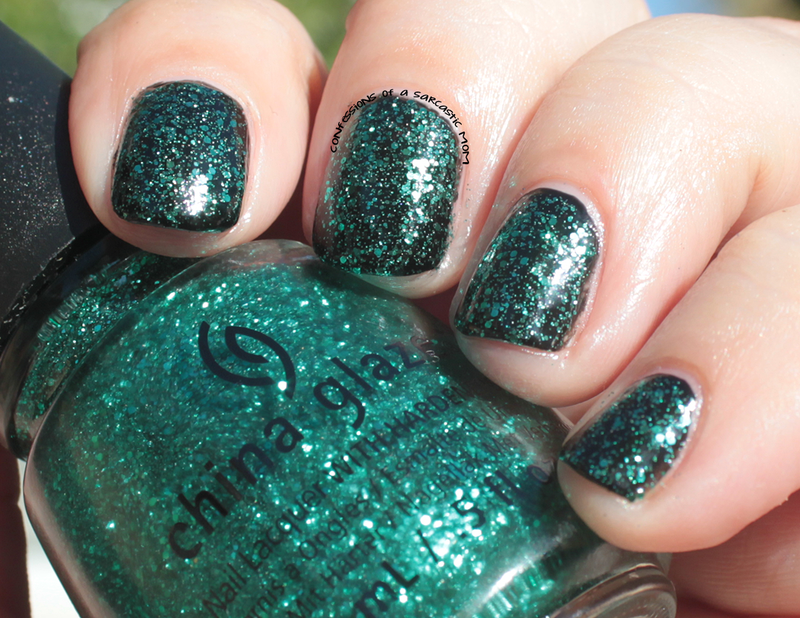 Pine-in For Glitter: Also over black, this green glitter is a bit chunkier than Feeling Twinkly. I mean, the glitter pieces are bigger and different haha This one could be built up on its own, I think. 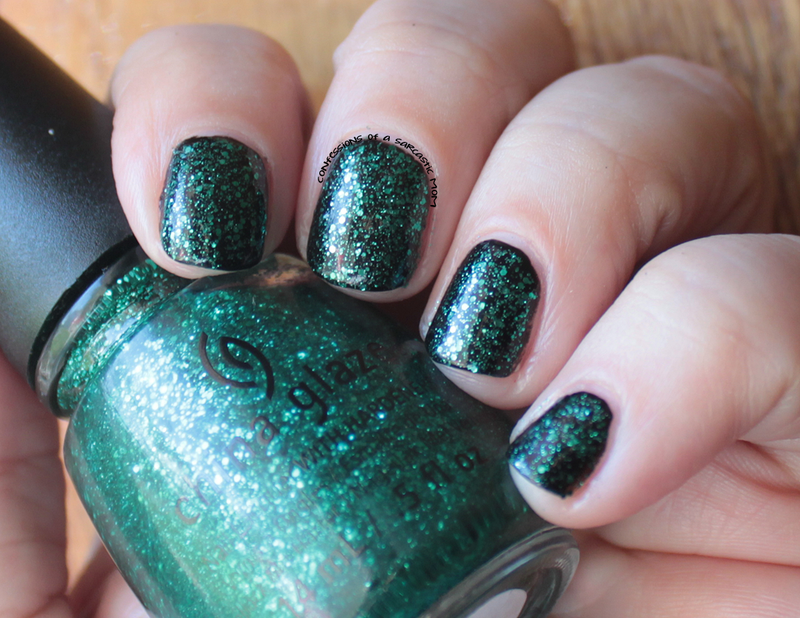 I don't think I own another glitter quite this color. 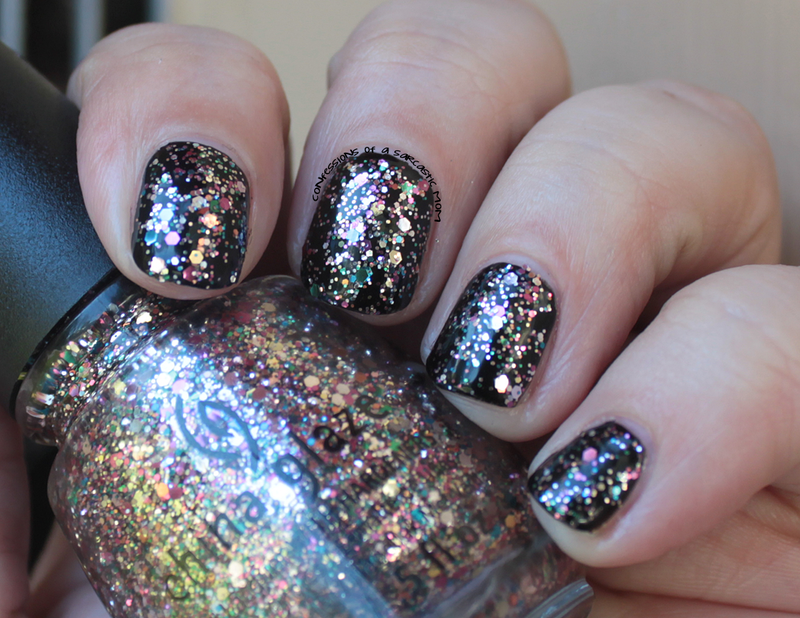 Dancing and Prancing: This multi-colored glitter is also shown over a black base. There's a lot of different colors here - I can catch pinks and blue and green, maybe orange or coral? 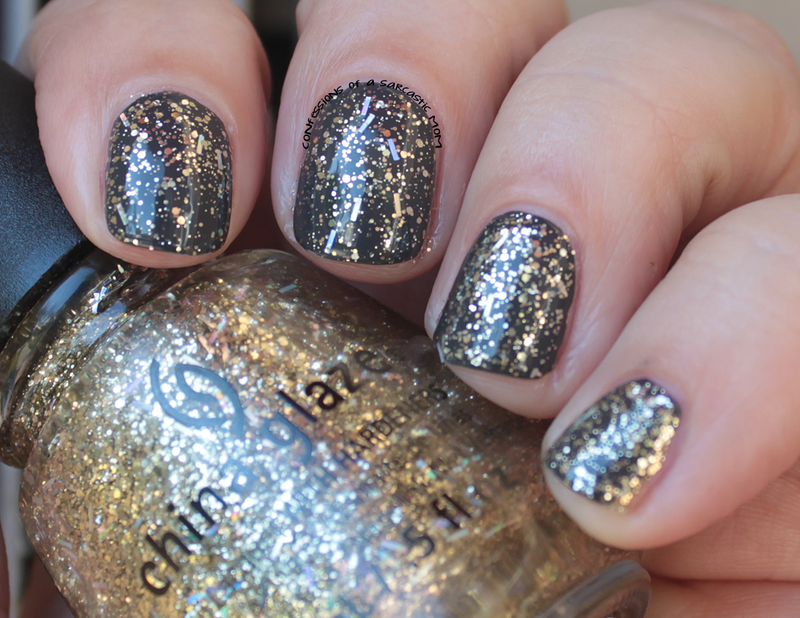 Very reflective, very blingy and totally fun! It's VERY densely packed, shown is one coat over black. 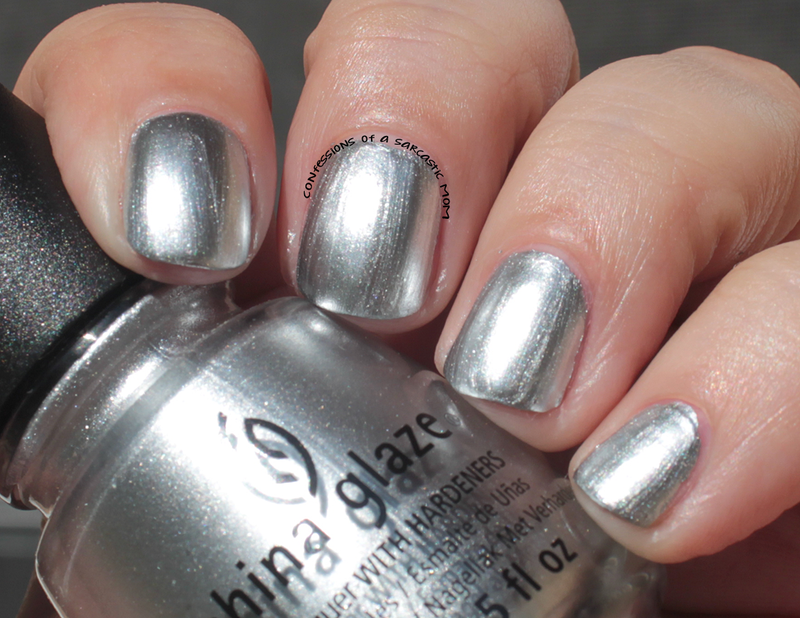 I'd Melt For You: This frosty silver is simply gorgeous, but it does show off all the flaws in my nails. 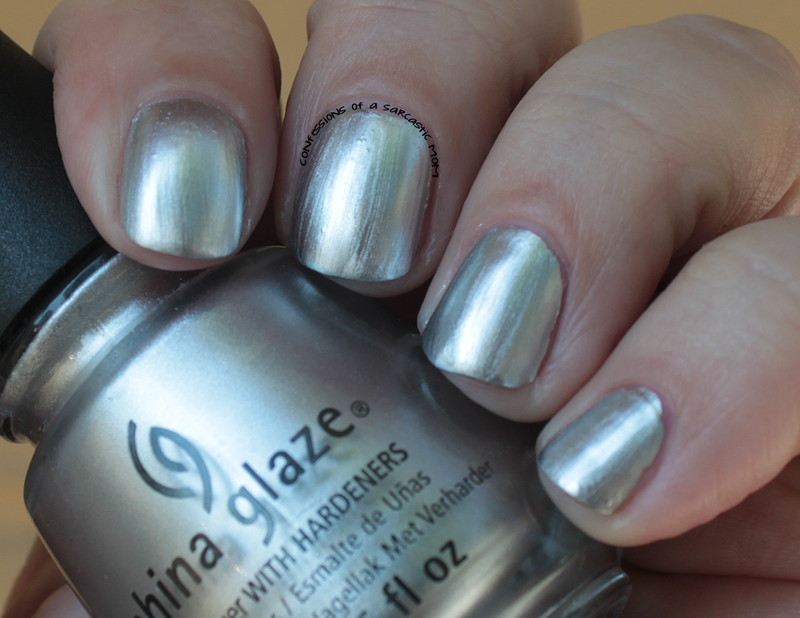 It has a chrome-like finish, and that is what causes it to expose the flaws. It's also very susceptible to streaking. 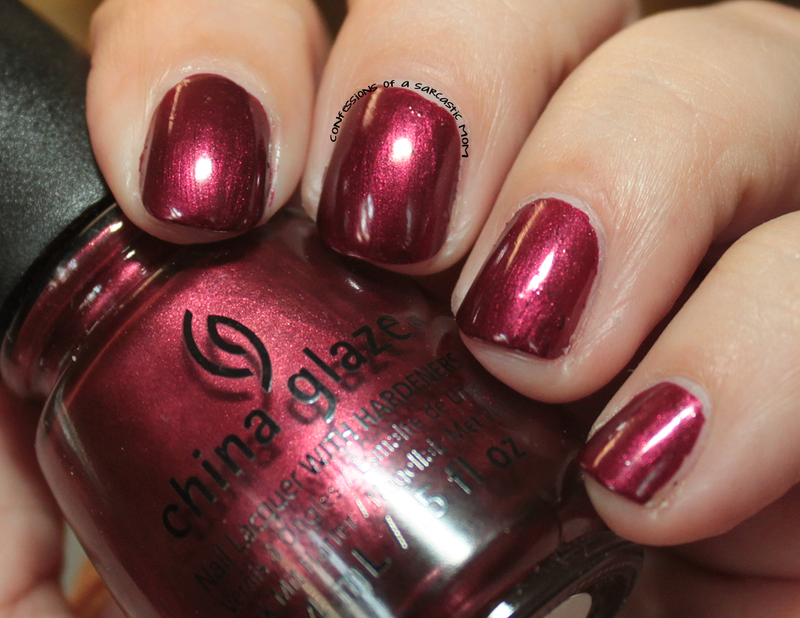 It's a nice polish, don't get me wrong, but it's temperamental. I used two coats. 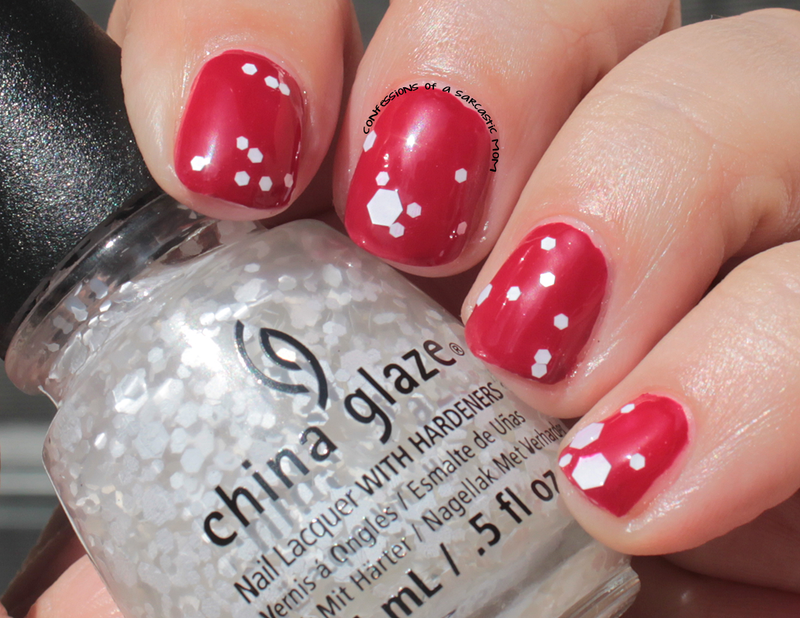 December to Remember: This one seems to be everyone's favorite, but I'm not bowled over by it. 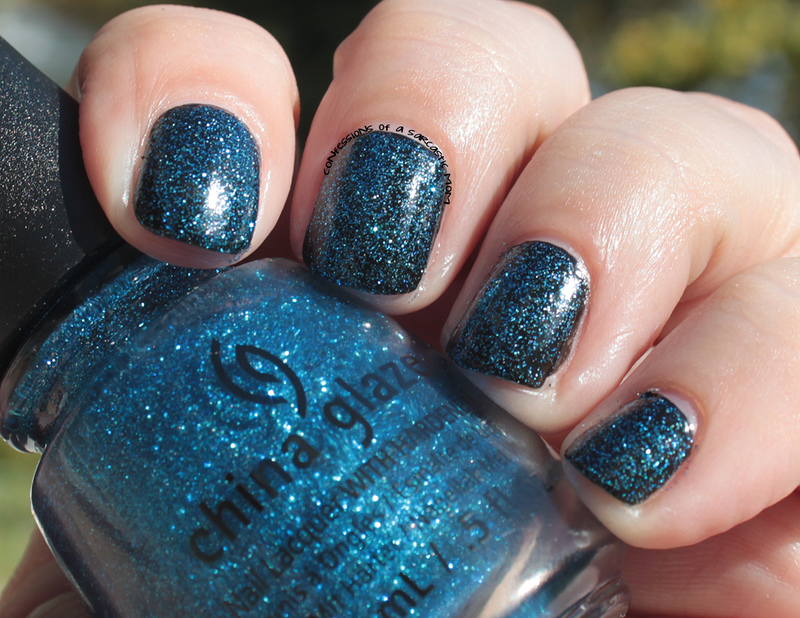 It's a very pretty blue shimmer, and in the shade you can really see the gold shimmer running through it. 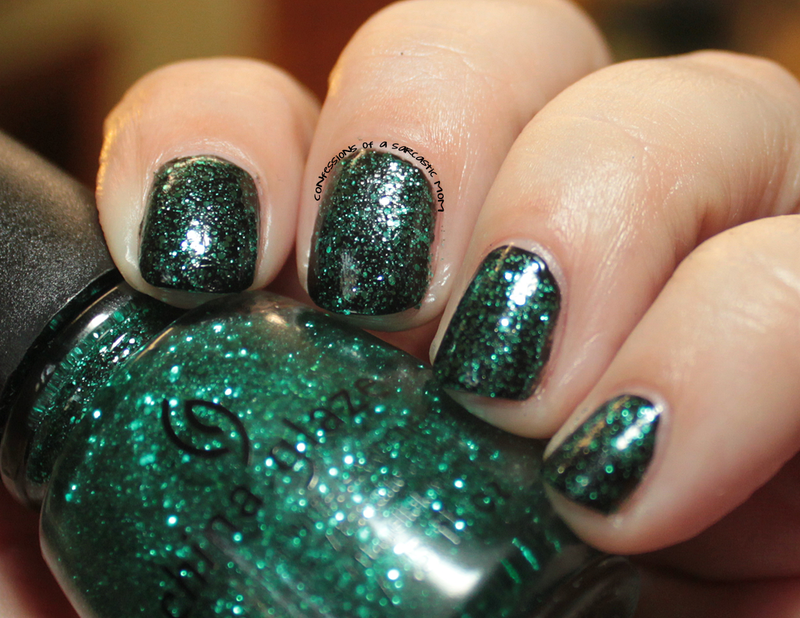 It's a lovely polish, but it just didn't capture my attention. 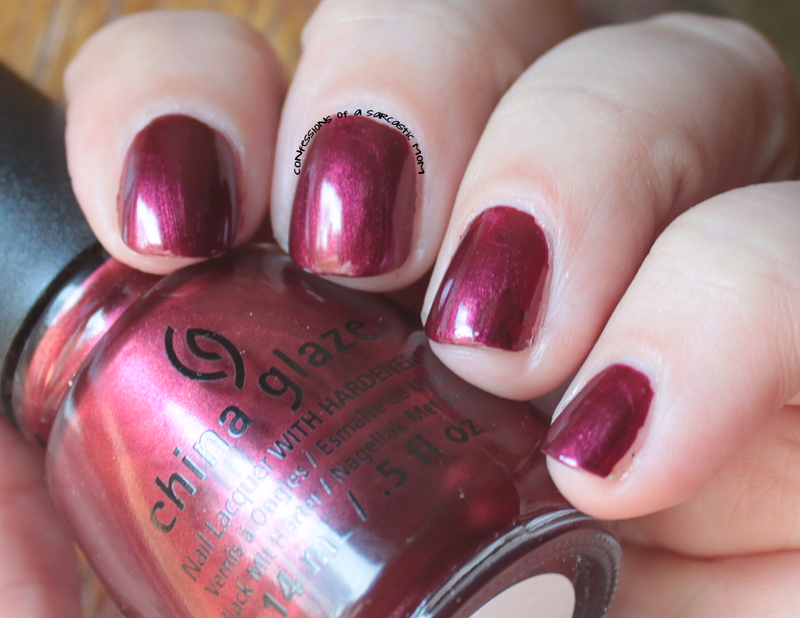 No Peeking: I didn't like this polish. 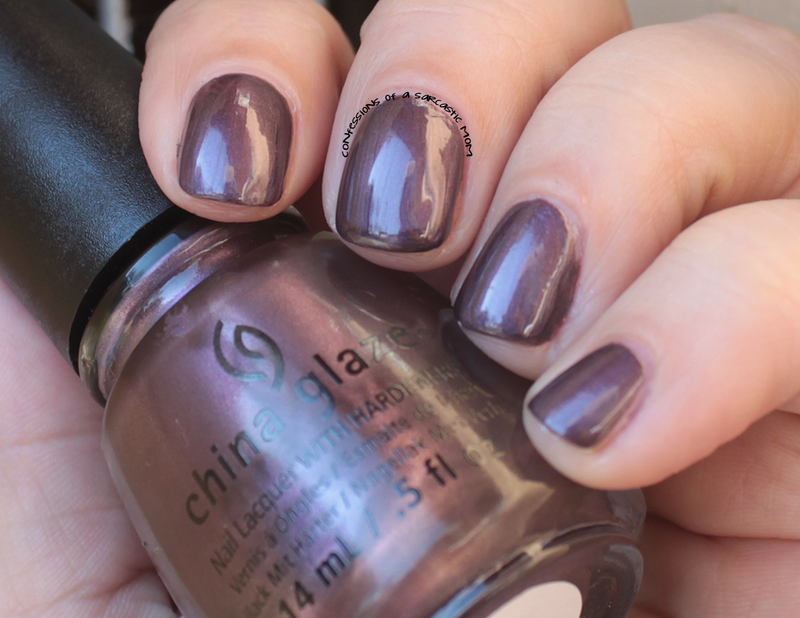 The color is neat - it's a dusty eggplant color - but the formula didn't mesh with me. The formula was so odd. 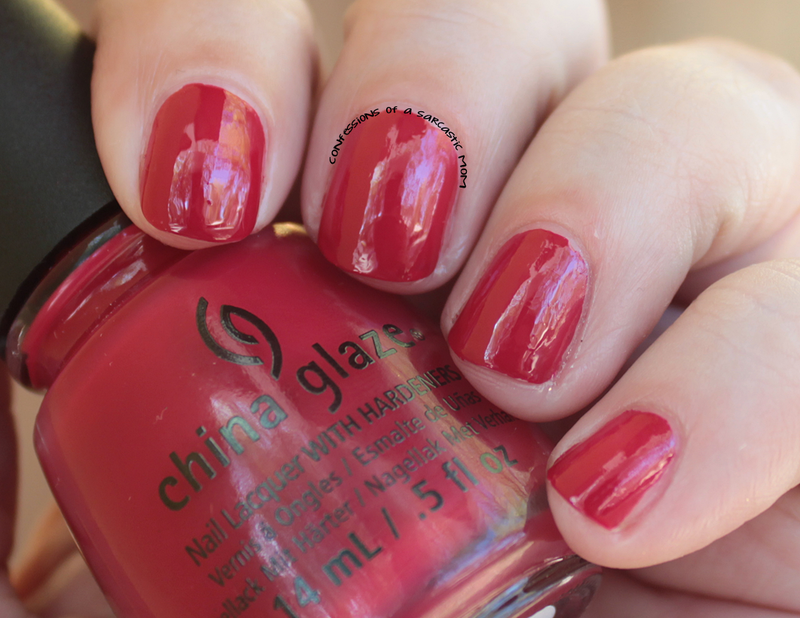 It was thin, yet goopy and it didn't ever truly settle on my nails. You can see on my tips. It's like the polish just... slipped to my tips and accumulated. 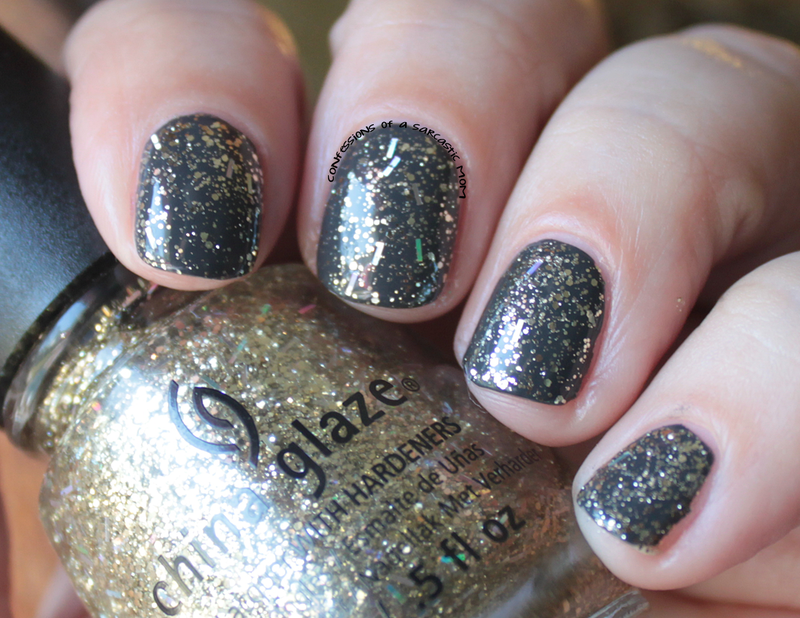 De-Light: This gold glitter is kinda cool. 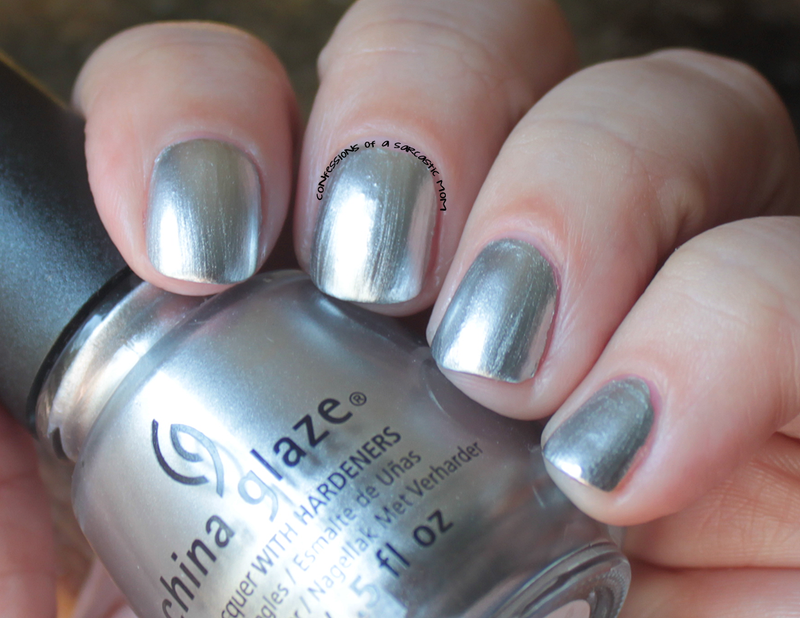 I put one coat over Out Like A Light, and it made the polish just look metallic! 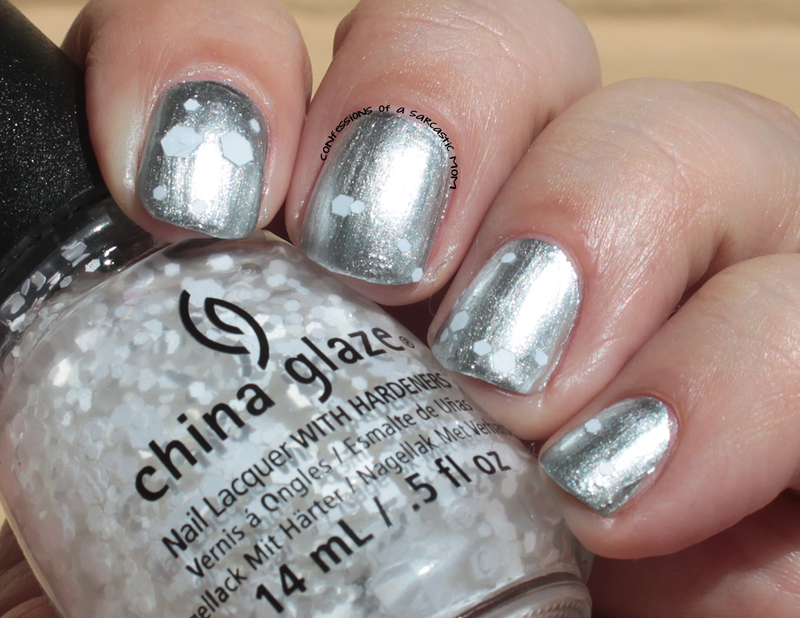 It's very densely packed and adds a ton of sparkle to just about everything. 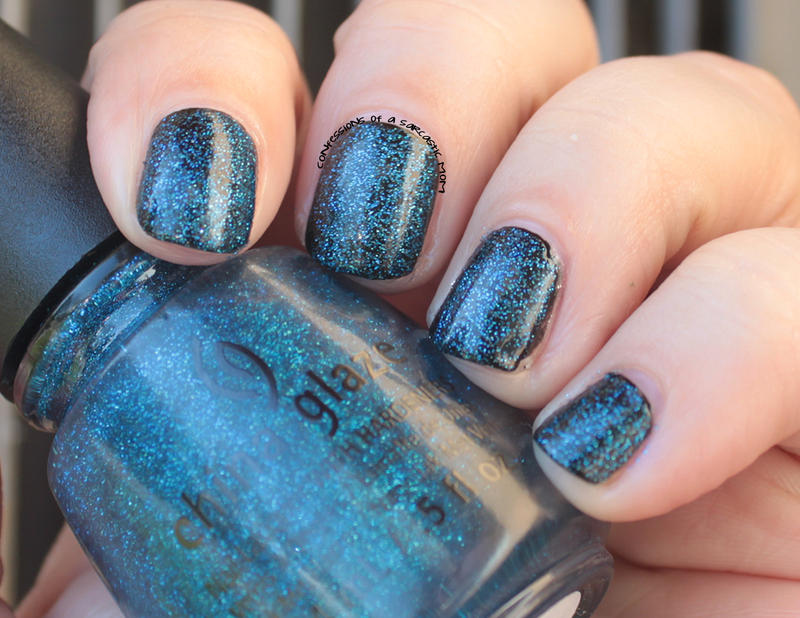 Meet Me Under The Stars: I wanted to love this polish. It reminded me of that one from the Hunger Games collection that I fell in love with. But this one just didn't measure up. 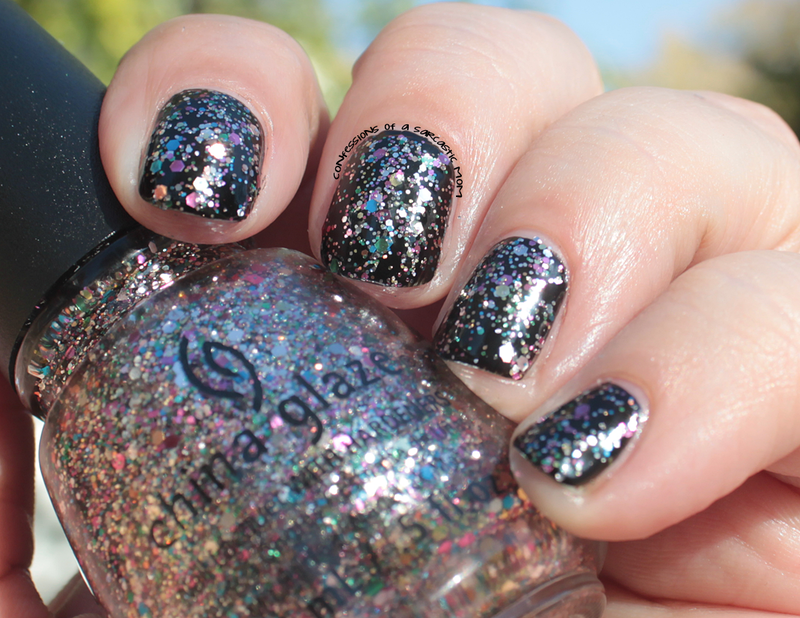 It's got micro holo glitter in a black base, but it just comes across as more murky and less sparkly. 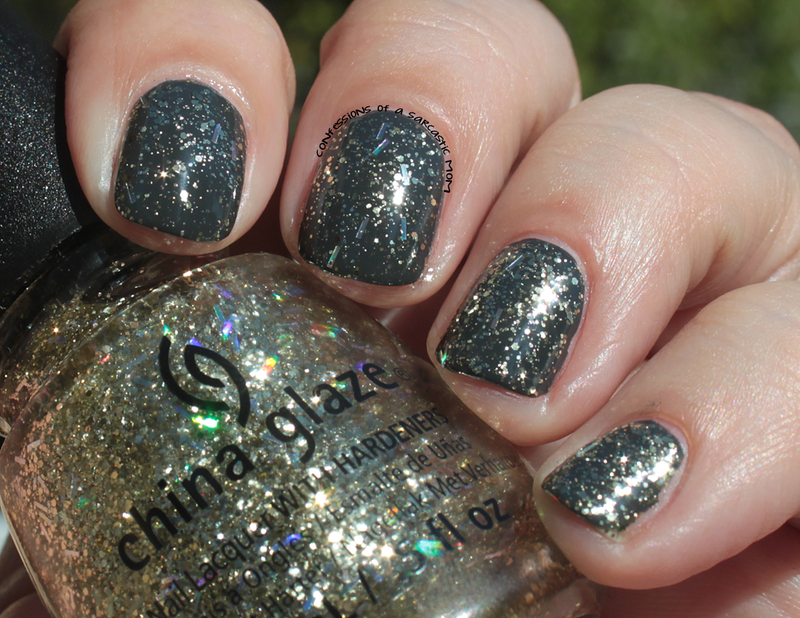 You can find these wherever China Glaze polishes are sold - I know they are out and on display at Sally's. Price varies by vendor. I was at Sally's yesterday, and I saw the display!